There's some traditions that don't change, and for those of us in Southern California, one of them is Grad Night at Disneyland. While I'm on a roll about graduation, I might as well reminisce about Grad Night, too. I sure do look stupid in the picture, but as with the picture I used for this blog's inaugural post, so many years have gone by since then that now I can laugh about it. Hmm.. what a great tie and shirt combo.. was I wearing my pajama top? The girl is Mitzi Takemoto. She looks great in the picture and I hereby apologize in advance should any of her friends run across the picture and make fun of her taste in guys. The thing is, I hardly knew her. She went to a different high school and it was my friend Dennis who introduced me to her. He said I should ask her to Grad Night and I didn't believe she would say yes, but he kept nagging so I did and she did say yes. 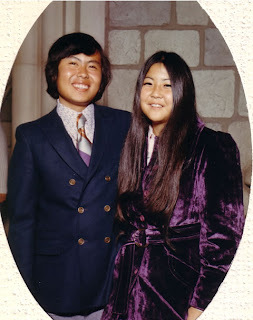 Dennis took her friend, Fumi Otani. My most vivid memory was riding in the bus out to Anaheim. Dennis, Fumi, Mitzi and I sat near the front along with our other friend Duane. Fumi seemed very intent on listening to Duane and his date, Karen, talk. Finally, she asked him something. "Your voice sounds so familiar. Do I know you from somewhere?" Duane thought about it and shrugged. "I don't think so." But Fumi was persistent. Finally, she put two and two together. "I talked to you on the phone," she said. "You called and asked to speak to Karen and I told you that you had the wrong number." It turned out that Karen's last name was also Otani. Duane had met her somewhere but didn't get her phone number, so he called every Otani in the phone book trying to reach her. One of them happened to be Fumi, who was not related to Karen. We all got a good laugh out of that one. I don't remember much about the rest of the evening until we got back to Dorsey around 6:00 the next morning, all wiped out. We took the girls back to Silverlake in Dennis' car, then returned to our Crenshaw neighborhood. Dennis dropped me off and I slept very well after that. Oh, I also remember that Mitzi was very nice but for whatever reason, as far as I can remember that was the last time I saw her. Years later - like lots of years, someone I knew told me that she was Mitzi's cousin. Small world, eh?